Julia Mattson grew up in Salzburg, Austria where she was a dressage instructor for several years. Julia moved to the U.S. in 2001 -- originally for the goal of improving her English enough to go back and teach English in Austria. Instead she decided to call scenic Oregon her home and put down her roots. Julia has been training and working with horses in Oregon since 2001. She trains horses (and owners) in many skills, using natural horsemanship and groundwork. 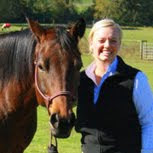 Julia is EAGALA certified for Equine Assisted Psychotherapy (EAP). She's an active rider and welcomes riders of all ages and experience levels. You can also read rave reviews about Julia on her References Page. Natural horsemanship is the philosophy of working with horses by appealing to their instincts and herd mentality. It involves communication techniques derived from wild horse observation in order to build a partnership that closely resembles the relationships that exist between horses. Click here for Wikipedia's definition. Groundwork is the foundation of an owner's relationship with a horse. A series of structured exercises performed (between owner and horse) on the ground, they gently reinforce an owner's authority to the horse. This interaction and instruction teaches a horse to follow an owner's lead and requests. This foundation building between owner and horse is much easier done from the ground as opposed to from the saddle, that's why it's called "ground" work. Click here for a great description of groundwork at the Alpha Horse site. Julia Mattson has been giving my daughter and her horse lessons for a month now, and I can't believe the progress both have made. She is great with the kids, very patient and wonderful with the horses as well. A clear knowledge of how to communicate with both and make it fun for them. I started riding with Julia last September; I truly haven't found another trainer like her. No one matches her positive attitude, her eagerness to teach, and the lengths she goes to for her students and horses, both in and out of the arena. I'm so happy I found Julia, I've become such a better rider and individual because of her! 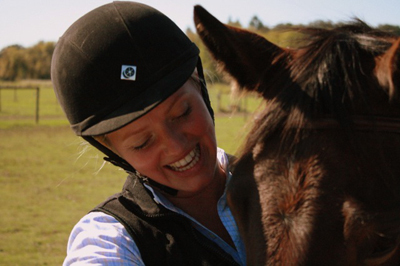 She is great with both beginners and advanced riders alike, and caters to any riding goals you have. She goes out of her way daily to give each student the best learning experience possible. Julia is a wonderful trainer and person to be around! I highly recommend her to anyone! Julia Mattson is a wonderful trainer for all ages! Happy Horse has provided many experiences to all ages including Kid's Horse Camp, Girl Scout Lessons, Trail Riding, tailered Mini Camps, And Camping trips with the horses to the beach and central Oregon. I have had my Oldenburg in training with Julia for almost 6 weeks now and am so impressed with his progress! I love the fact that she is SO patient and spends so much time getting him to trust her. Julia has went above and beyond with his training (not just in the arena, but on the trail, over bridges, through water:). I can not say how pleased I am and would recommend her as a trainer to anyone, you would be lucky to work with her!